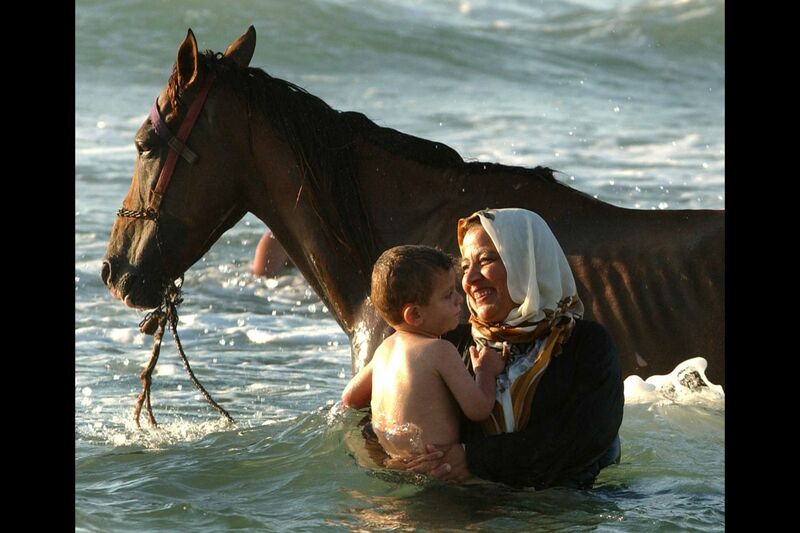 A Palestinian woman swims in the sea with her son while their horse is washed of the dust from the streets. 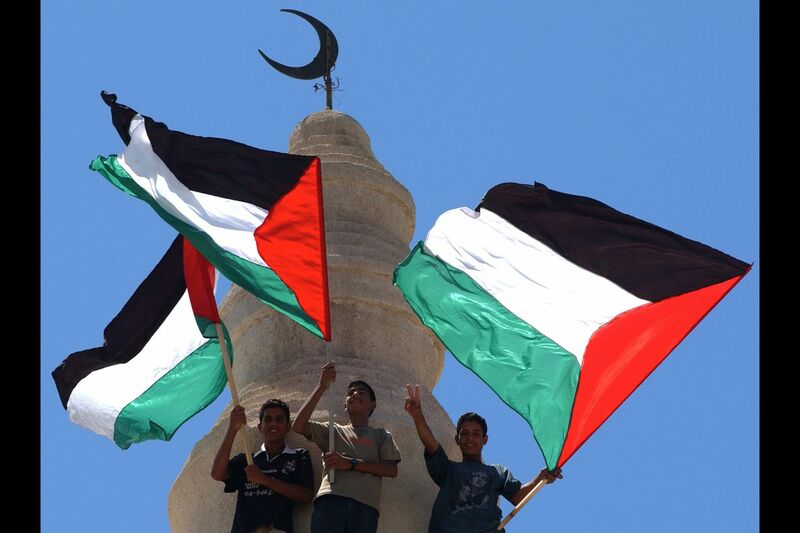 Boys wave Palestinian flags from the roof of a mosque during a funeral. 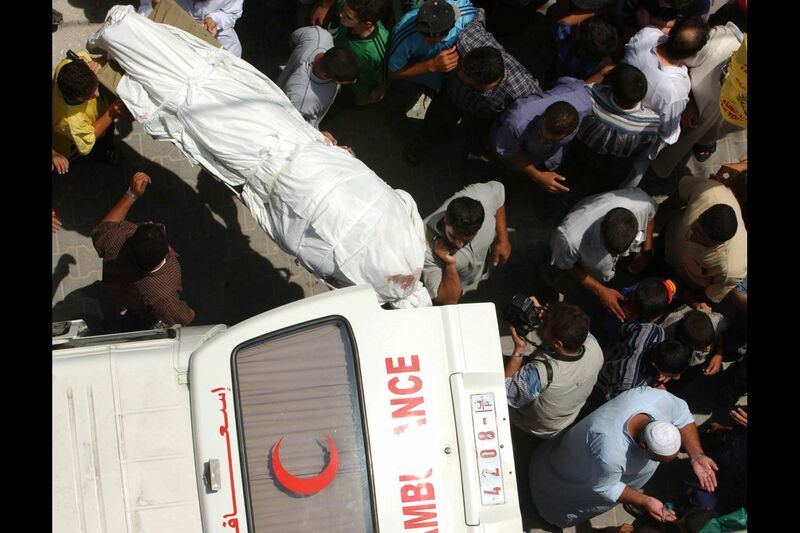 Mourners carry a Hamas gunman who was shot by Israeli soldiers as he carried a bomb towards the fence around Gaza. 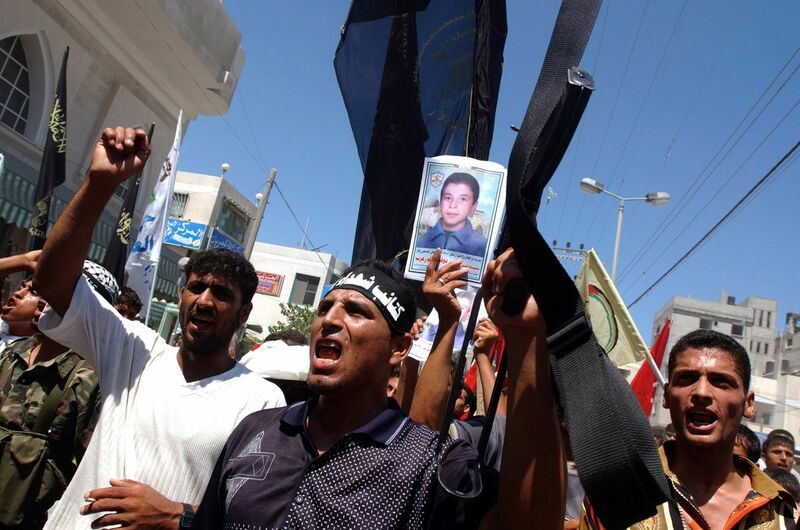 Palestinian gunmen lead the funeral procession for 15-year-old Ayman Zerob, who was shot by the Israeli army. 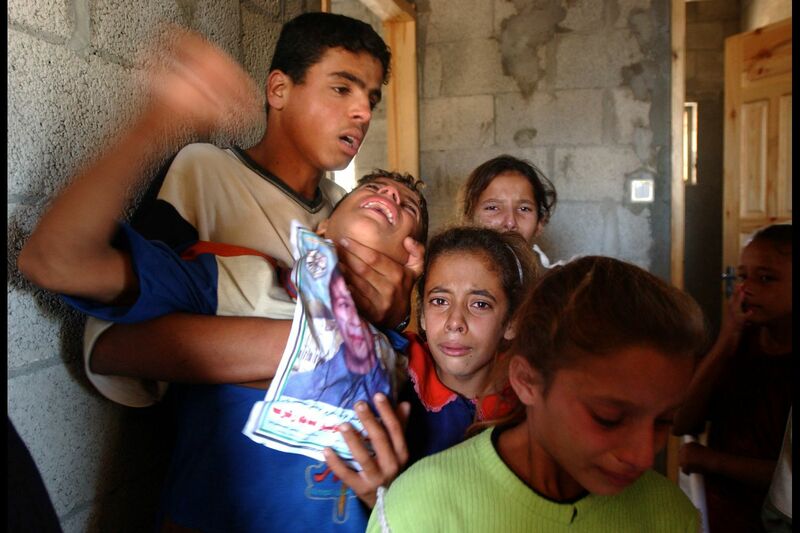 In the two years of the uprising, 250 Palestinian children have been killed. 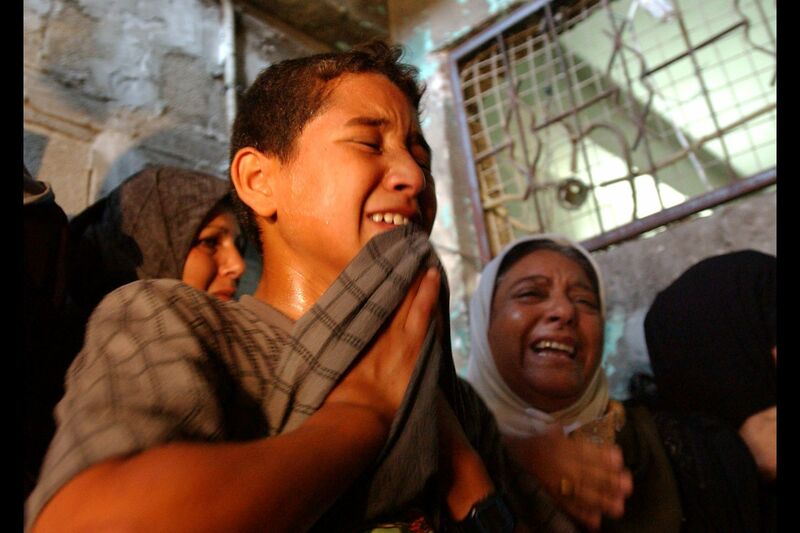 Ahmed Faras cries at the funeral of his five-year-old brother Ayman, who was shot by Israeli tank fire. 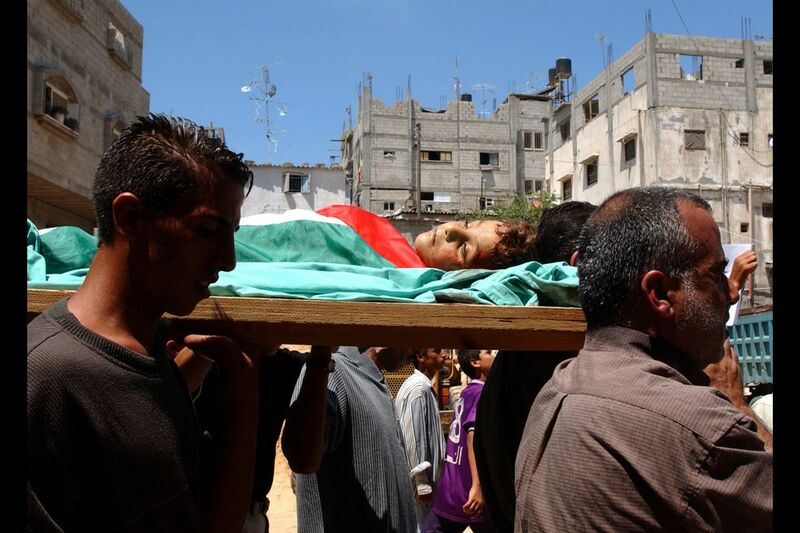 Mourners carry the body of five-year-old Ayman Faras through the streets during his funeral. 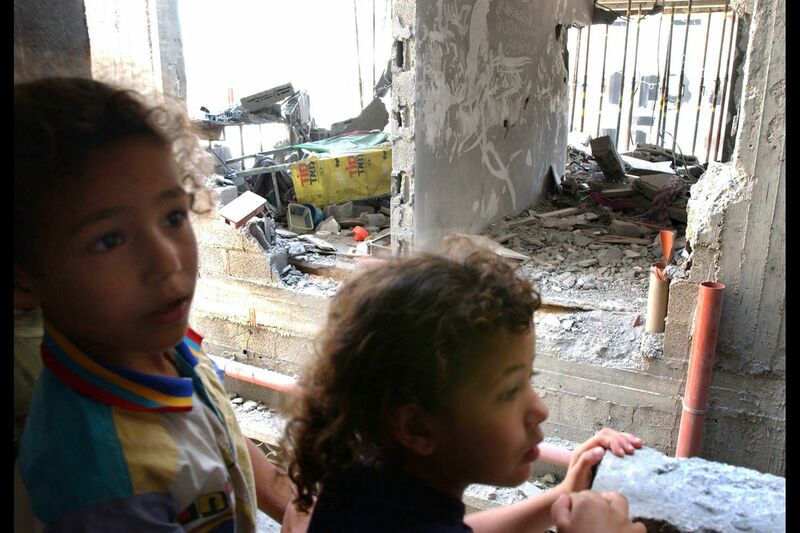 Haneen Ellah, 8, (L) and her sister Ikram, 6, look out of the window of their house at the site where an Israeli plane dropped a one-ton bomb. 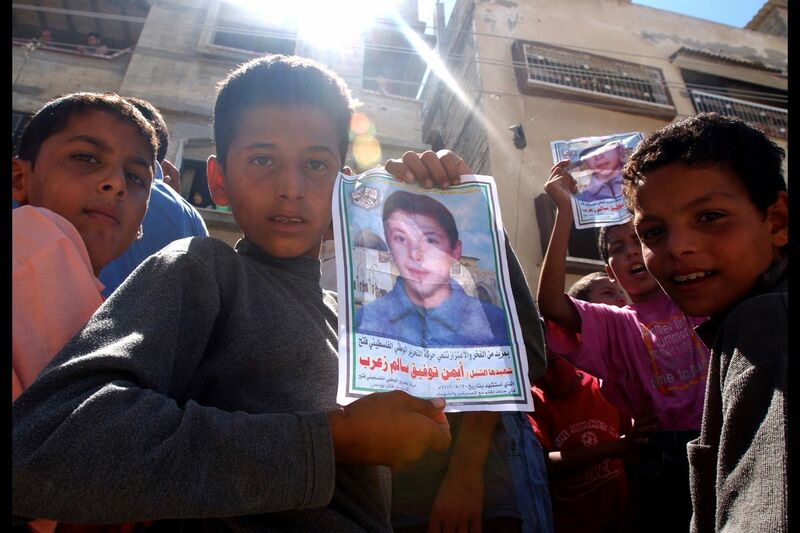 Mohsen Ellah, 8, (R) and his brother Abdel Maati, 4, look away when a mental health counselor tries to get them to talk about the night when an Israeli plane dropped a one-ton bomb on the building next door, killing nine children they knew. Ayman Faras' mother weeps as she holds her five-year-old son's clothes during his funeral. Friends of 15-year-old Ayman Zerob hold up a poster at his funeral celebrating him as a martyr, after the boy was shot by the Israeli army. 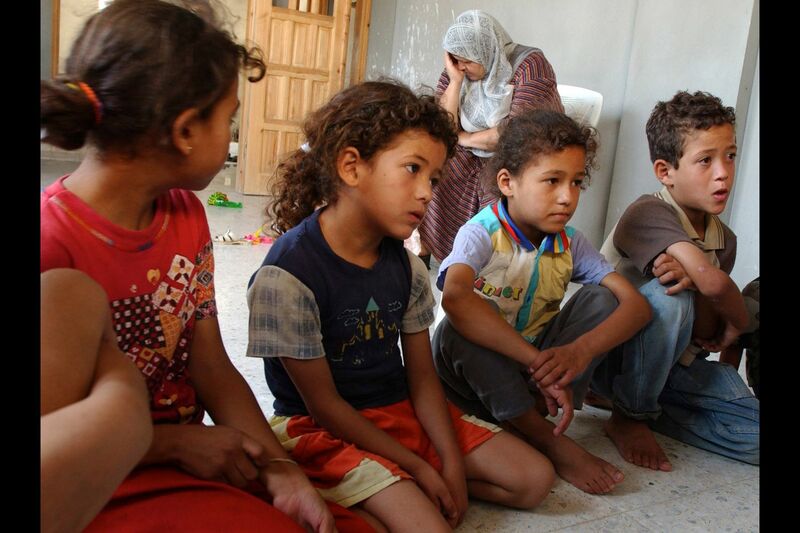 Nafidah Ellah (back R) holds her head in her hand as her children talk to a mental health counselor. Many of her 16 children have had nightmares in the month since an Israeli F-16 dropped a one-ton bomb on the building next door. 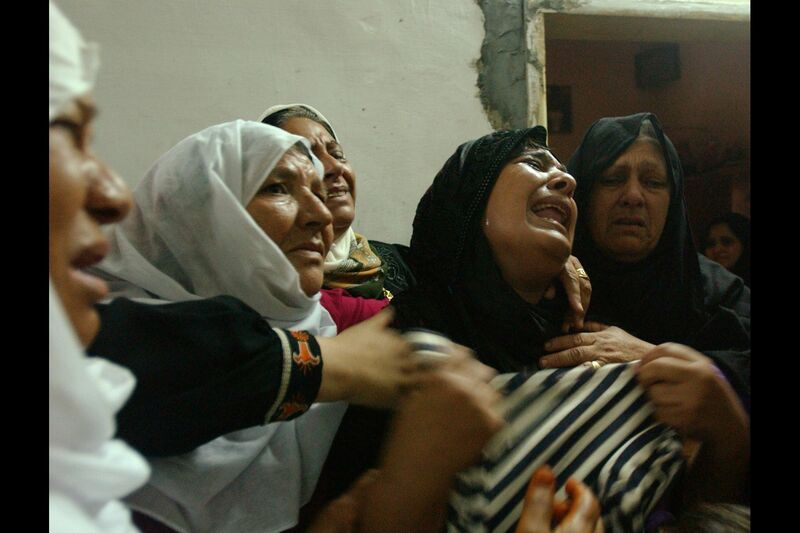 The brother of 15-year-old Ayman Zerob grieves with other relatives during the funeral. The apartments bordering the Israeli settlement have been reduced to rubble. 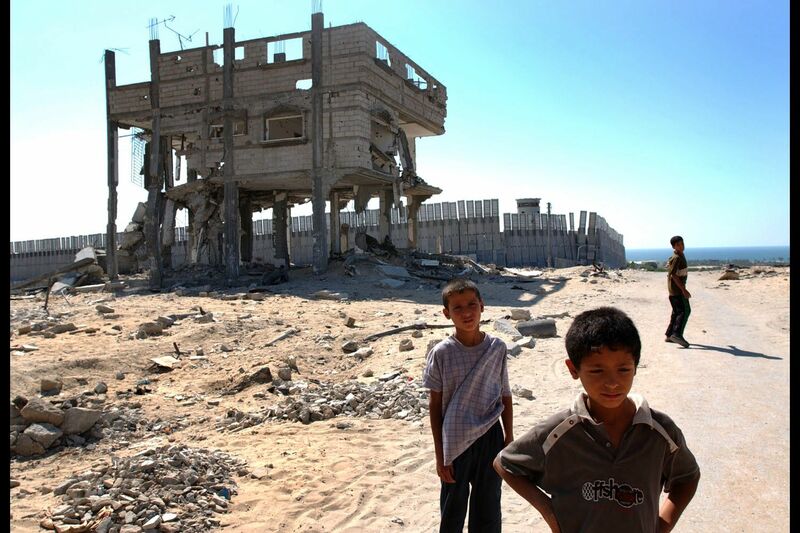 Israel has taken control of 40% of the land in Gaza, keeping some 20,000 soldiers to protect the 6,000 settlers. 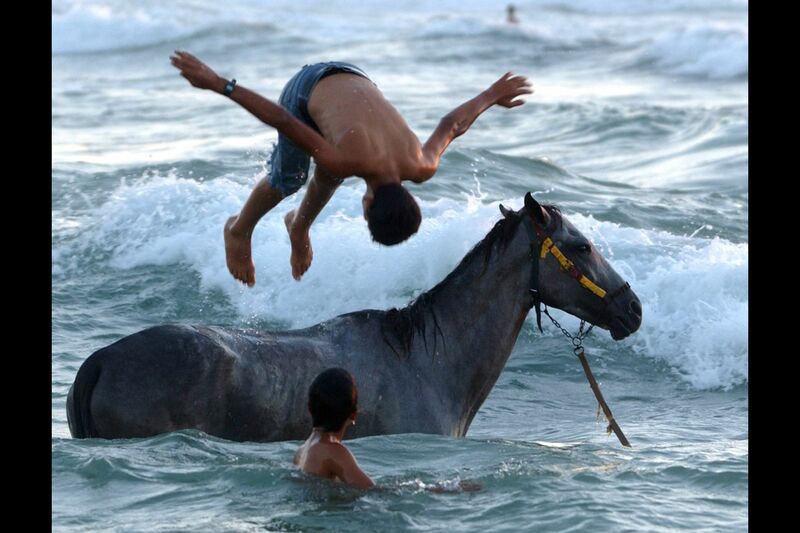 A Palestinian boy dives off a horse into the Mediterranean Sea. 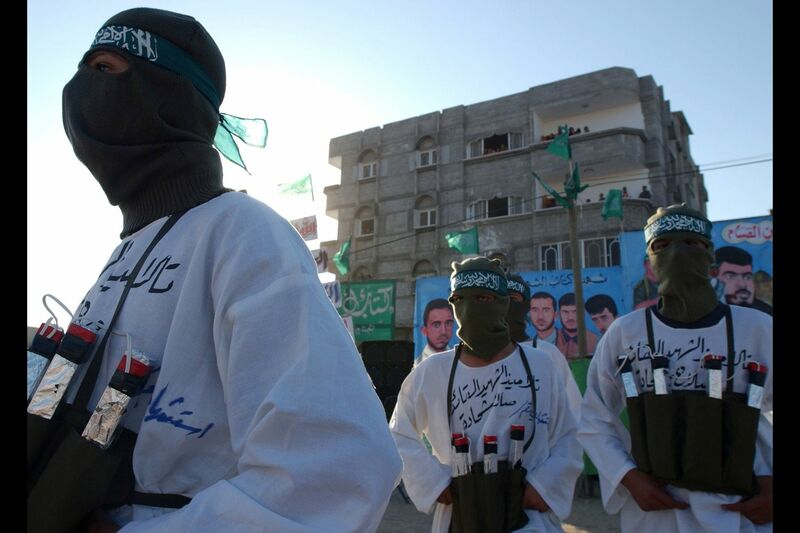 Members of the militant group Hamas parade at a rally dressed as suicide bombers. 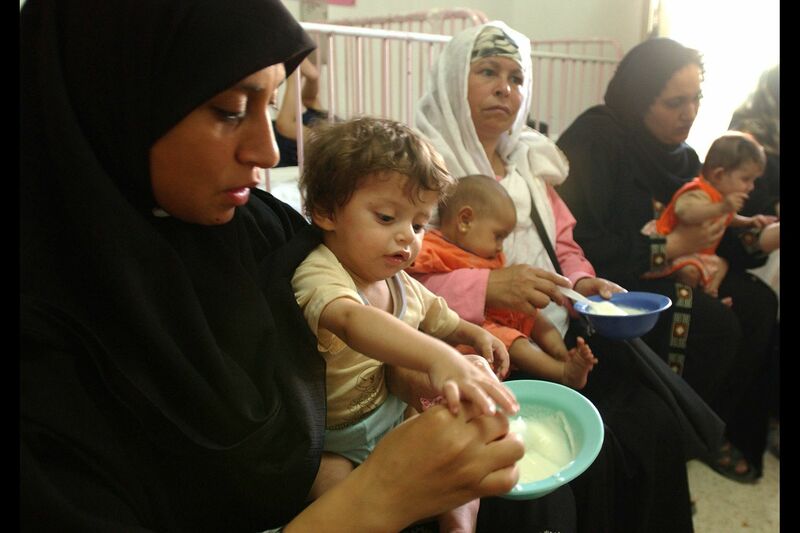 Mothers of malnourished children are provided with food at a health center. 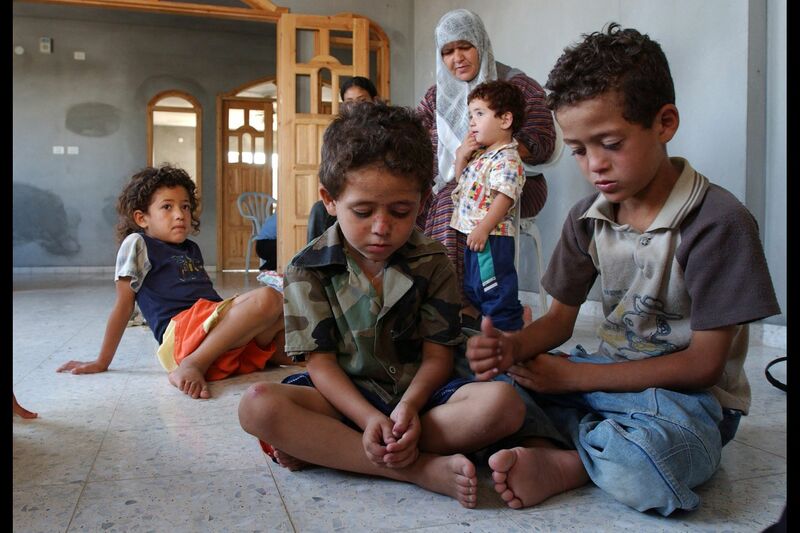 Around 5,700 Palestinian under-fives in Gaza were reported malnourished in 2001, more than double the previous year. A mother brings her severely malnourished child into the center for feeding. 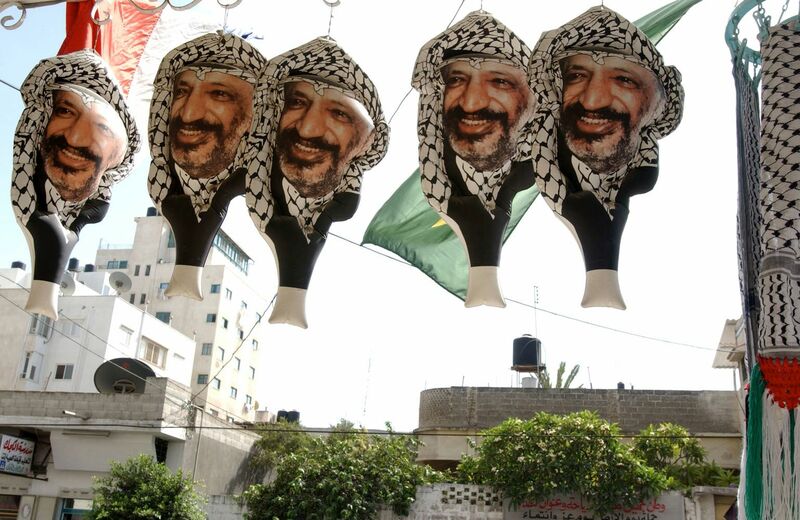 Inflatable souvenirs of Palestinian Authority Chairman Yasser Arafat hang in the PLO flag shop. 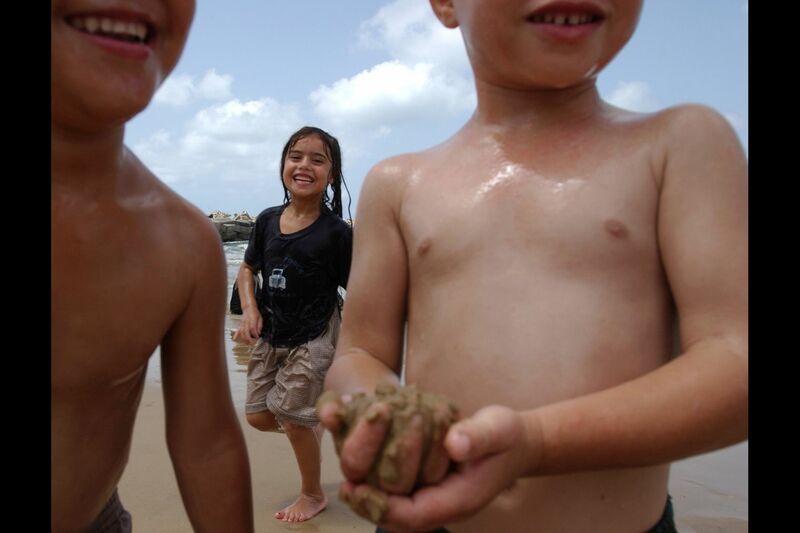 Women swim fully clothed, following Islamic laws of modesty. 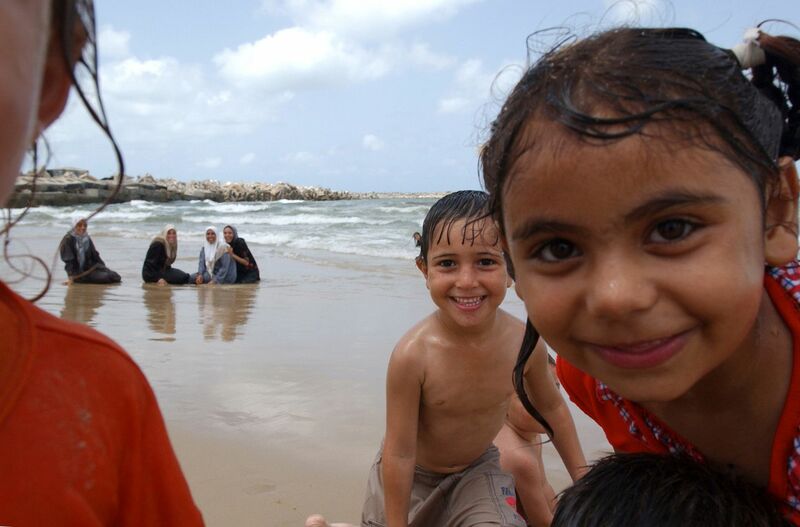 A Palestinian girl plays with her brothers on the beach. 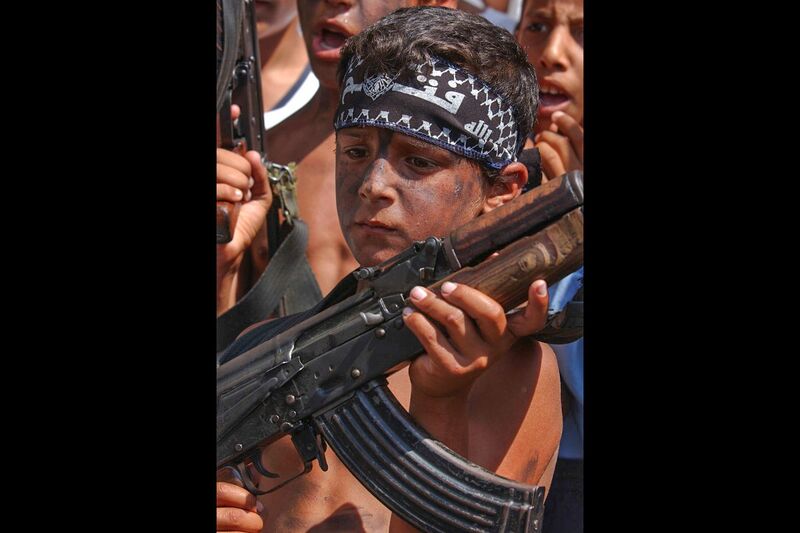 A boy chooses not to join the chanting at a march in support of Iraqi President Saddam Hussein. 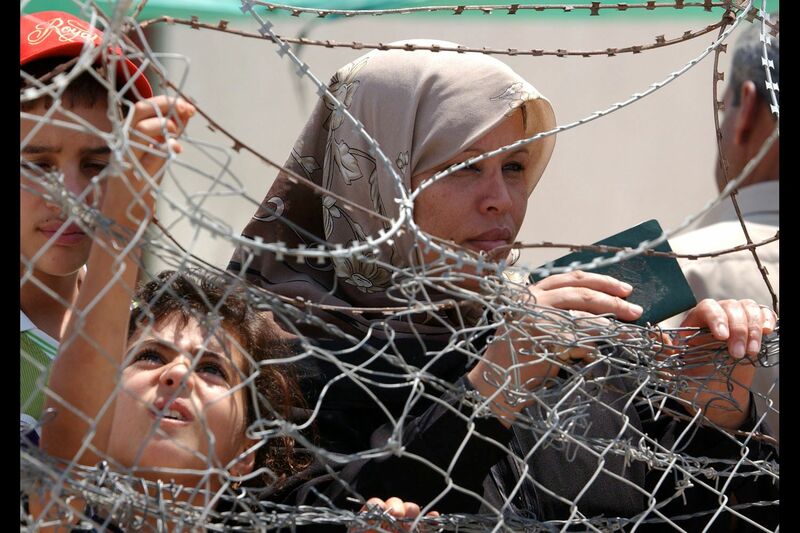 A Palestinian woman waits with her daughter to cross the only Egyptian border in southern Gaza. Israeli authorities only let 200 people through daily, though many more crowd the area in the hot sun hoping for permission. 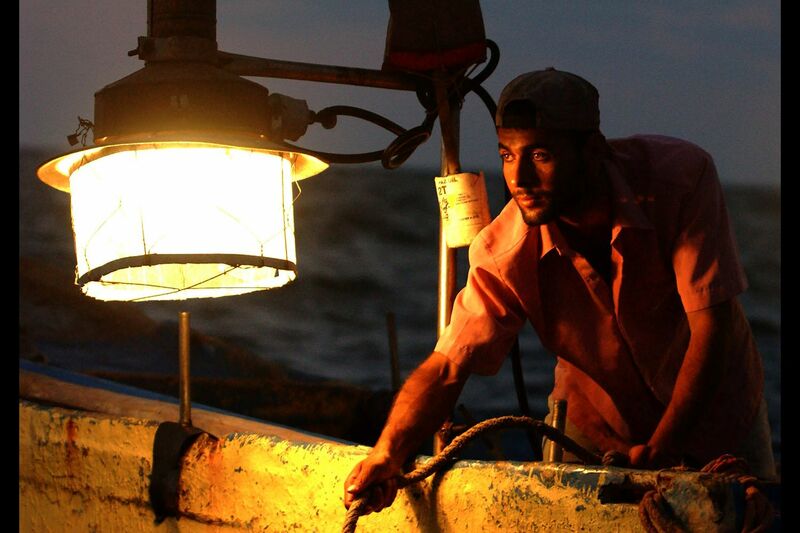 A Palestinian fisherman secures a net on the side of his boat. 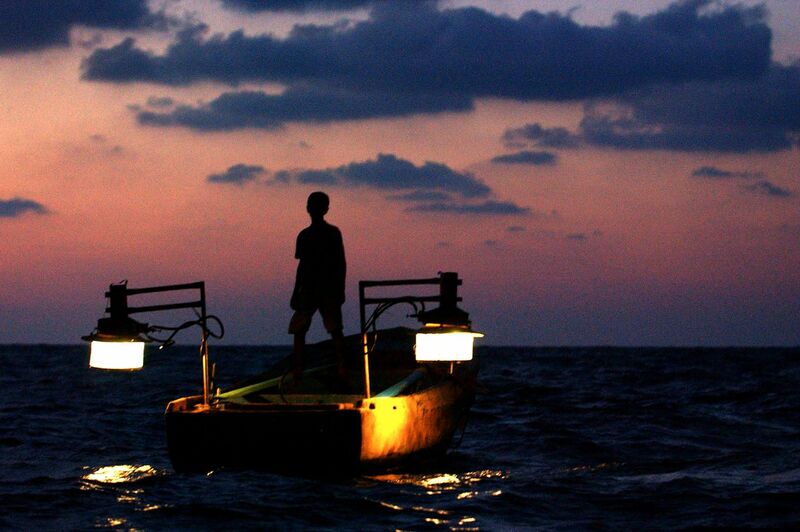 A Palestinian boy waits on a boat after lighting lanterns to attract fish.